And so we find ourselves in a new year — yesterday was a holiday, today we returned to normal time. I kicked things off by tackling the moving boxes that have been sitting in the corner of Gabriel’s bedroom since we moved to this apartment eighteen months ago. Why now, after letting them sit there for a year-and-a-half? Your guess is as good as mine! The boxes ended up in G’s room because I wasn’t really thrilled about the basement in our building — not horrible, but definitely basement-y: some bugs here and there, a bit musty, and long overdue for some cleaning attention. I didn’t want the boxes, which will [theoretically] be carrying our possessions to our non-existent house one day, getting musty or pest-infested, so I kept them upstairs, and this was the most out-of-the-way option. 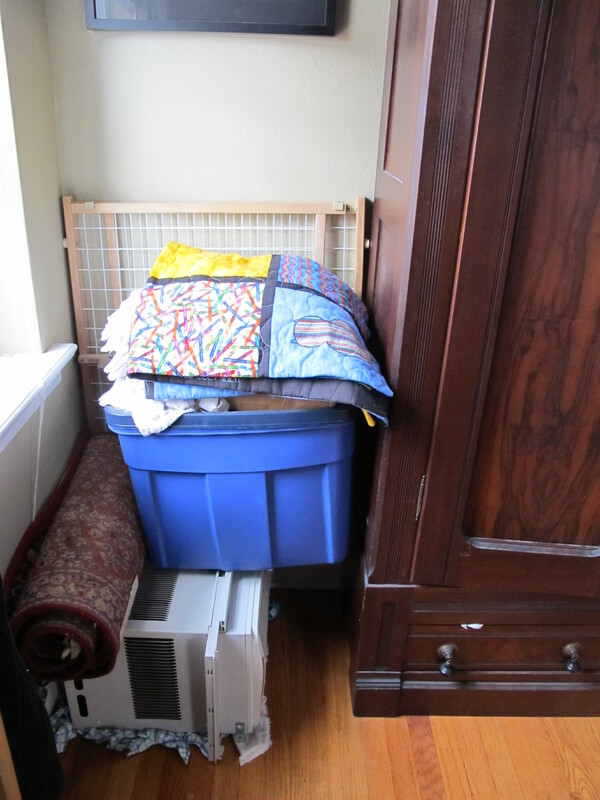 That corner of Sir’s bedroom has not seen the light of day, nor the business end of a vacuum or dust rag, since we finished unpacking, and, since it doesn’t appear that we’ll be repacking them anytime soon, I decided I wanted the boxes out of there. Several trips carting boxes down two flights of stairs (empty, broken down boxes are so awkward and unwieldy to move — gah! ), followed by some cleaning and rearranging in the bedroom, and voilà! This little project won’t be completely finished until we get the window AC unit out of there, but somehow I don’t think I’ll have any immediate takers on that item with our current arctic weather. At least all of the dust is gone, and I can fully open the curtain in that corner. The boxes are now in the basement, where I should have put them in the first place, I suppose. The blue plastic bin in the photo, which previously inhabited a different corner of Sir’s bedroom, is stuffed to overflowing with his old baby clothes. The minimalist, decluttering side of me just wants to drop everything off at the St. Vincent de Paul thrift store and be done with it, but I can’t quite bring myself to do that. Maybe that will be a project for next year. Hey! 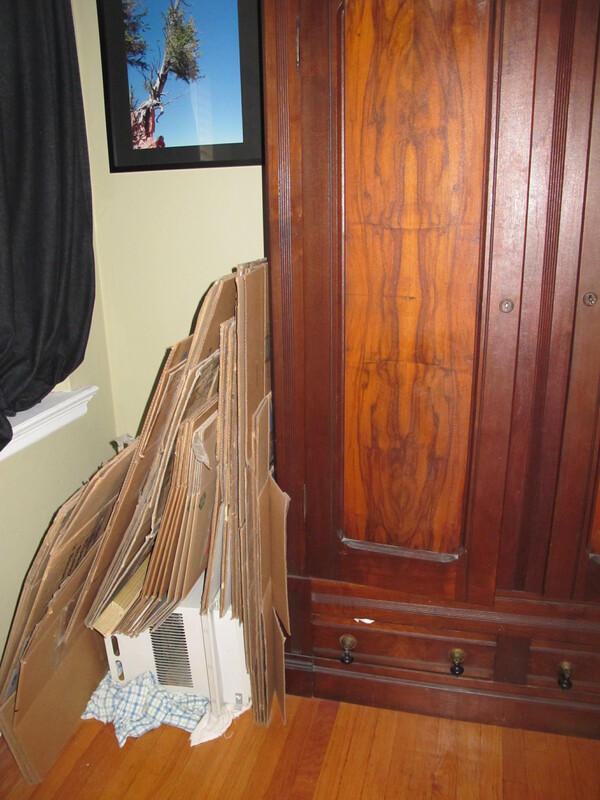 If you want to get rid of the cardboard, people are always looking for free moving boxes on craigslist. You can get rid of them quick. When you’re ready to move again just google “plastic moving boxes” and there are companies in every major US city (including STL) that rent plastic reusable moving boxes. My GF works for an environmental non-profit and we started a company doing it in Florida. Hmm, I looked into renting plastic moving boxes when we moved in June 2012, and I did not find any companies offering the service for residential moves in St. Louis (there were some doing commercial moves), but maybe it’s changed since then. I plan to pass on our cardboard boxes via Craigslist when we eventually buy and move into a house, since we envision that as a “final” move. However, I’m hesitant to let good (i.e., clean, known-origin) boxes go now, when we’ll probably need them relatively(?) soon. I’m afraid I’d be stuck with either buying new or gambling on someone else’s CL boxes being in equally good condition. Moving of boxes is very tough work. I didn’t do this work. When ever removal of work is coming in my home, I never participate in this work. We always contact removal companies.